Red-hot pokers became very unpopular in the garden for a while but whilst I do have some of the more common and slightly vulgar red and yellow flowered varieties the more subtle orange and yellow (as pictured below) or the completely yellow ones such as Kniphofia 'Percy's Pride' take some beating in the garden. With a variety of species, you can have Kniphofia in flower from late spring into autumn too. These look great dotted around the border to add height and architectural interest or can look great planted en masse under a tree. The only problems I find with them are slugs and snails seem very attracted to them but as they are quite tough you can use this to your advantage and use this plants as an easy way to find and then destroy the slugs and snails without the danger that they will have destroyed your plant in the meantime. The other problem is they can turn into enormous clumps which are hard work to lift and divide. Whilst leaves do become messy by the end of the season I have found that simply pulling out the dead leaves at the base of the plant and then chopping back all the rest in early spring before new growth tidies up the plant a lot and reduces its suffocating spread over neighbouring plants. Some favourite varieties: Percy's Pride with its sulphur yellow flowers; 'Little Maid' whose flowers change from pale green to cream - this plant also stays much smaller and neater; 'Jenny Bloom' with coral-coloured flowers; 'Bees' Sunset' with vibrant yellow-orange flowers. 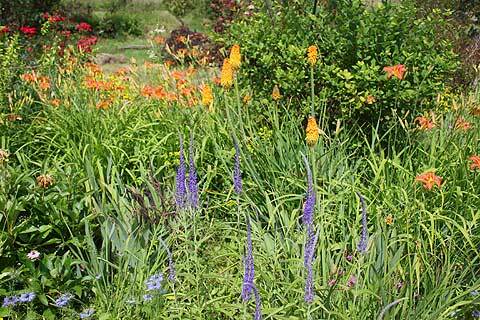 Kniphofia is great when planted with other richly coloured flowers such as crocosmia. In my garden it is often in flower at the same time as my euphorbias and the combination of deep orange and zingy green is wonderful. 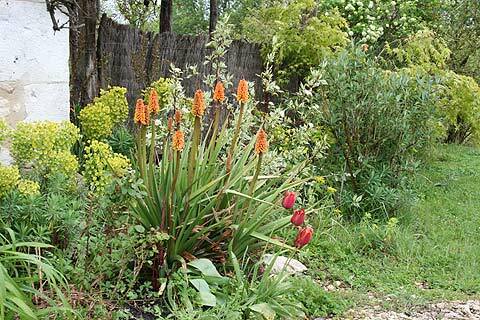 Kniphofia are extremely vigorous and sturdy plants. Whilst they prefer well drained soil they like to be kept moist in summer. Having said this mine are thriving on clay soil even in baking south of France summers! Propogate by division in the spring.